I haven't made any secret of my dislike for overdue fines. In all honesty, I'm just happy to have the book back so the student can check out some new ones. Fines were the bane of my existence at my last school, where some students--for whatever reason--made no effort to pay off these pesky little fines. Having a fine over 50 cents also meant they didn't get any new library books until they paid their fine down to below 50 cents. In some cases, students even used their library fines as an excuse to not have a book to read in class. I decided to give them another way to pay off fines. We tried doing a canned food drive, but we got very few cans and still had plenty of unpaid late fees. I tried doing a R.O.B.O.T. Challenge (Returning Our Books On Time) between classes and grade levels. That helped a bit, but it still wasn't nearly enough. Then I had an epiphany. All the students need to read. They read for their classes; they read for DEAR time; they are supposed to read at home, too. Reading is free, so there could be no excuse for not reading to pay off the fines. One minute of reading = one cent off the fine. A fine of 50 cents could be cleared by reading a total of 50 minutes. Students who told me they were reading off a fine were allowed to check out one library book at a time in order to make that happen. Even if their fine was over 50 cents (our limit for checkout). They can't read off a fine if they do not have a book. Students could only read off their own fine. They were not allowed to read off a friend's fine. The student's parent/guardian or any of their teachers could sign the read-off bookmark. This made it easier for students with delicate family situations. The minutes could be broken up over several days or, if necessary, a few weeks. In most cases, the Fine Read Off only applied to overdue fines. Students who lost or damaged a book were still expected to pay for a replacement. You could, however, use it at your discretion for a student who, due to financial hardship or family circumstances, is unable to pay off their lost or damaged book. 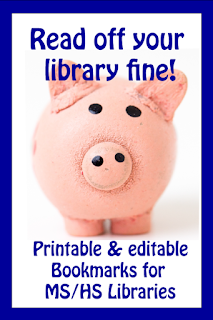 The Fine Read Off bookmarks are super-easy to use; just print, cut, and hand them out. 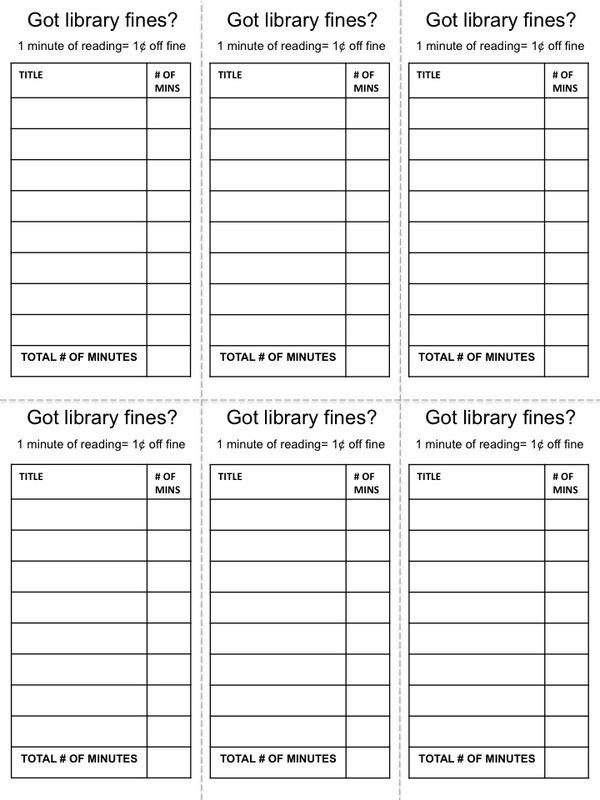 For every minute students read, they subtract one cent from their library fine. 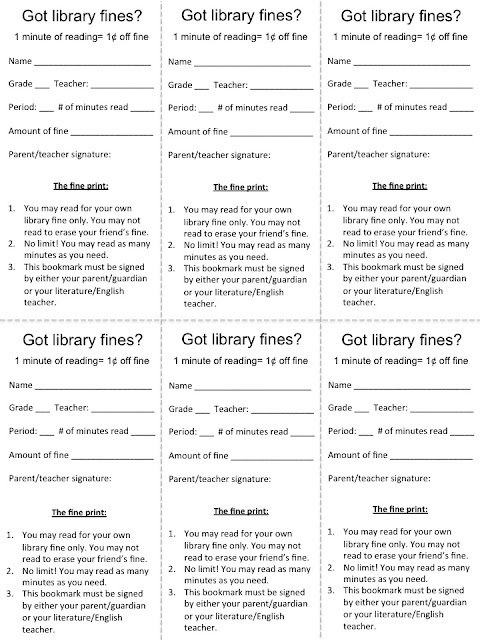 When they've read enough to pay off the fine, they get their parent or teacher to sign the bookmark (verifying students read what they said they read) and voila! The fine disappears, and the student can finally get a new book! It's truly win-win, especially for those students who are not checking out any new books because they owe a fine. These bookmarks are available free at my TPT store. Open the PowerPoint file to edit the bookmarks to suit your library. There are six front-to-back bookmarks on each page, which will help save paper. 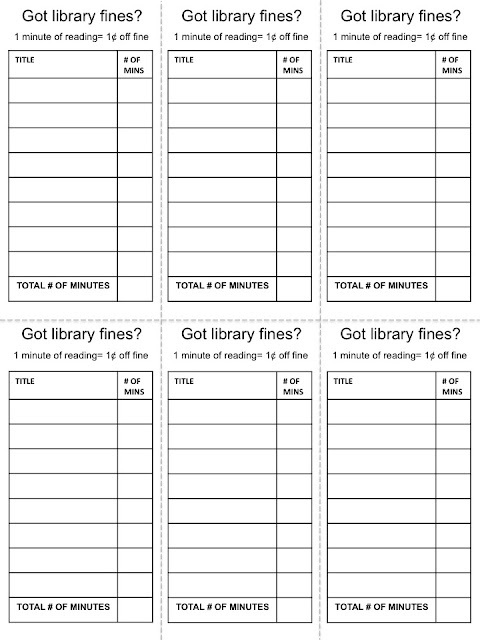 Can Schools Legally Hold Report Cards for Non-Payment of Library Fines?